What do you need to do start up a project? How is the work divided between the Project Board and the Project Manager? How is the Project Manager going to issue work to Team Managers? How do Team Managers give assignments to members? How does the Project Manager stay informed about progress of work? How are products delivered back to the Project Manager by the Team Manager? How does the Project Manager handle issues and risks? How does the Project Manager communicate with the Project Board? How will the Project Board manage the project using Management By Exception? How is the project divided into stages and how are these stages managed? What does the Project Manager need to do to prepare project closure documents? How can the Project Board close the project in a normal way and prematurely? We are a PRINCE2 Accredited Training Organization (ATO). Our PRINCE2 Foundation is a 3 day course with the official PRINCE2 Foundation certification exam given at the end of the third day. We strongly recommend to our customers dedicate sufficient time before the training to pre-course preparation according our instructions. We recommend to spend approximately 20 hours with pre-course preparation, accorss at least a week, or preferably over two weeks just before the course. The course consists of a well balanced mix of theory and practical exercises. 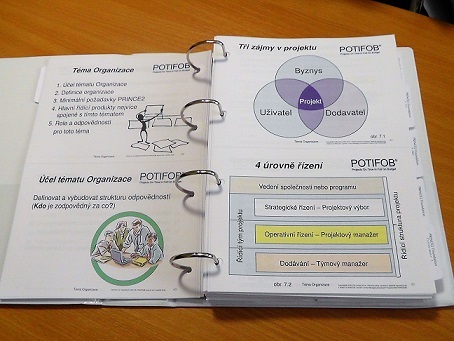 The course can be delivered in English, German, Czech or Slovak. 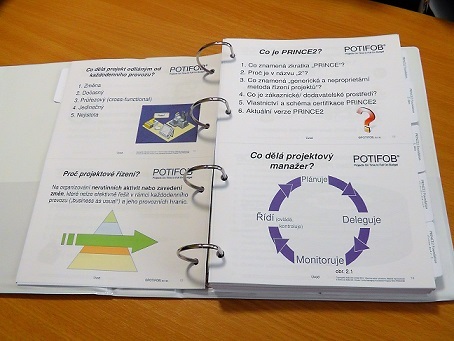 The training materials are available in English, Czech & Slovak. For PRINCE2 2017 courses, a backward compatibility package consisting of PRINCE2: 2009 slides, which are different or removed from the 2017 version and of a version transition dictionary. 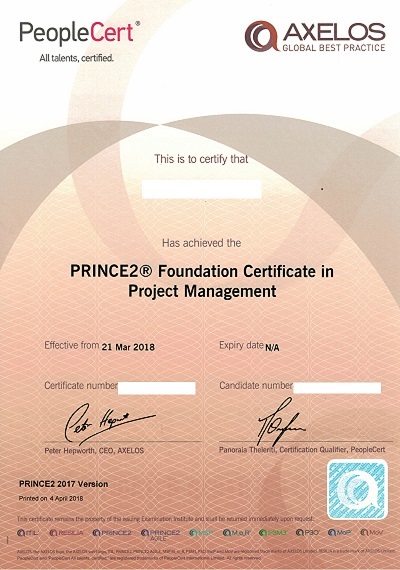 At the end of the course delegates can take the PRINCE2 Foundation certification exam (if delegates want to take the PRINCE2 Practitioner exam, they have to take the PRINCE2 Foundation exam first). For more details about the exams format see our comparison. Course participants who have a disability / support requiremets are entitled to appropriate relief during the exams. For more information on this please contact us. The purpose & responsibilities of all roles. The 7 principles, 7 themes, 7 processes, and the Product-based Planning and Quality Review techniques. Which management products are input to, output from, and updated in the seven processes. The purpose of all management products and the composition of the Business Case, Product Descriptions, Issue Report and the Issue, Risk and Quality Registers. The relationship between principles, processes, themes, deliverables & roles within a PRINCE2 project. You will obtain preliminary exam results immediately. English PRINCE2 exams are available in the 2017 version only. Other language mutations of PRINCE2 exams still are and will remain available in the old - 2009 version. However, we recommend the new version of exams to all those whose English is sufficient. PRINCE2 2017 exams have fewer questions than PRINCE2: 2009 exams, with the same total time available to answer them. Further, PRINCE2 2017 exam certifiates are marked as such, proving that you know the most current version of PRINCE2. We run our courses as public, semi-open and in-company. Please see our Public Training Courses Calendar or our upcoming public PRINCE2 courses. If you are interested in an in-company or semi-open training offer, please contact us, giving the desired number of delegates, course location and date range. Our public PRINCE2 Foundation courses cost from 755 € per person + 180 € per person & attempt AXELOS® exams (depending on location). For in-company course pricing please contact us, giving the desired number of delegates, course location and date range. 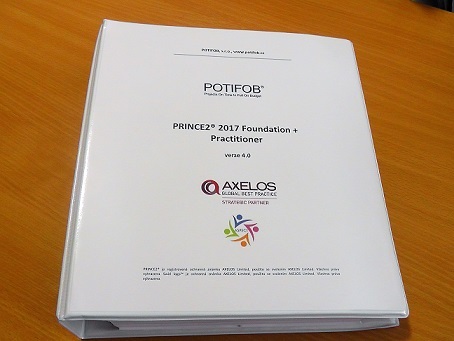 If you book PRINCE2 Foundation & Practitioner with us together, the total price for both courses is from 755 € per person + 425 € per person & attempt AXELOS® exams. This special offer cannot be combined with any other special offer or discount. *When taking this offer you will receive already for your PRINCE2 Foundation pre-course preparation the Best Practice publication „Managing Successful Projects with PRINCE2", which contains the full PRINCE2 method, instead of the lightweight AXELOS PRINCE2 Pocketbook.